The Canon imageRUNNER 5020i Copier boasts output speeds of up to 50 pages-per-minute, while supporting copy, print, send, scan, and mail box capabilities. Featuring Canon's Universal Send technology, the IR5020i Copier acts as a centralized communications hub. It is a great fit for companies that share information among workgroup members, communicate with other employees and partners outside the immediate area, store documents and forms for print-on-demand applications, and route documents to file servers and databases. Incorporating Canon's newly-developed MEAP (Multifunctional Embedded Application Platform) architecture, the Canon imageRUNNER 5020i Copier gives businesses greater control over costs and improved productivity by embedding diverse and customizable applications for a wide range of business workflow requirements. 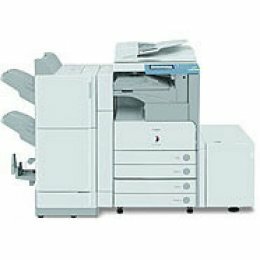 The Canon IR5020i Copier is the device for organizations looking to improve workflow efficiencies through the ability to customize their equipment to individual needs.